Pregnancies eligible for study inclusion, exclusion criteria, and construction of the 2 study cohorts: 1 for pregnancies exposed to vaccination in the first trimester and 1 for pregnancies exposed to vaccination in the second or third trimester. aBecause it is possible to have more than 1 of the exclusion criteria, the numbers do not add up to 8177. Cumulative incidences and hazard ratios of hospitalization comparing unexposed children and children exposed to vaccination in the first trimester (A) and second or third trimester (B). Rate ratios (RRs) with 95% CIs comparing disease risk in unexposed children and children exposed to vaccination in the first trimester (A) and second or third trimester (B). IR indicates incidence ratio; NE, not estimable; PY indicates person-years. eTable 1. ICD Codes for Study Outcomes in Analyses of Individual Conditions. eTable 2. Standardized Mean Differences to Assess Balance of Covariates. Statens Serum Institut. Status for influenza-epidemien. http://www.ssi.dk/~/media/Indhold/DK%20-%20dansk/Aktuelt/Nyhedsbreve/EPI-NYT/2009/2009%20PDF/EPI-NYT%20-%202009%20-%20uge%2049.ashx. Accessed November 2, 2016. Clayton D, Hills M. Statistical Models in Epidemiology. Oxford, England: Oxford University Press; 1993. Question Is pandemic influenza A(H1N1) vaccination in pregnancy associated with an increased risk for early childhood morbidity in offspring? Findings In this cohort study, children exposed to maternal vaccination during pregnancy were not significantly more likely to be hospitalized in early childhood than unexposed children. Meaning These results support the safety profile of influenza A(H1N1) vaccine used in pregnancy. Importance Several studies investigating potential adverse effects of the pandemic A(H1N1) vaccine have supported that influenza A(H1N1) vaccination does not increase the risk for major pregnancy and birth adverse outcomes, but little is known about possible adverse effects in offspring of A(H1N1)-vaccinated mothers beyond the perinatal period and into early childhood. Objective To evaluate whether pandemic influenza A(H1N1) vaccination in pregnancy increases the risk for early childhood morbidity in offspring. Design, Setting, and Participants Register-based cohort study comprising all live-born singleton children in Denmark from pregnancies overlapping the A(H1N1) influenza vaccination campaign in Denmark, from November 2, 2009, to March 31, 2010. From a cohort of 61 359 pregnancies, offspring exposed and unexposed to the influenza A(H1N1) vaccine during pregnancy were matched 1:4 on propensity scores. Exposure Vaccination in pregnancy with a monovalent inactivated AS03-adjuvanted split virion influenza A(H1N1)pdm09 vaccine (Pandemrix; GlaxoSmithKline Biologicals). Main Outcomes and Measures Rate ratios of hospitalization in early childhood until 5 years of age. Hospitalization was defined as (1) first inpatient hospital admission, (2) all inpatient hospital admissions, and (3) first hospital contact for selected diseases, which included individual infectious diseases and individual neurologic, autoimmune, and behavioral conditions. Results The mean (SD) age at end of follow-up was 4.6 (0.40) years for the 61 359 children included in the study. In the cohort, the mothers of 55 048 children were unvaccinated, 349 mothers were vaccinated in the first trimester, and 5962 mothers were vaccinated in the second or third trimesters. Children exposed in the first trimester were not more likely to be hospitalized in early childhood than unexposed children (hospitalization rates per 1000 person-years, 300.6 for exposed vs 257.5 for unexposed; rate ratio, 1.17; 95% CI, 0.94-1.45). Similarly, children exposed in the second or third trimester were not more likely to be hospitalized in early childhood than unexposed children (hospitalization rates per 1000 person-years, 203.6 for exposed vs 219.3 for unexposed; rate ratio, 0.93; 95% CI, 0.87-0.99). This 7% decreased risk was primarily a result of reduced risks for infectious disease–related hospitalizations. Conclusions and Relevance To our knowledge, this is the most comprehensive study to date of potential adverse effects manifesting after the perinatal period. We detected no increased risk for early childhood morbidity. These results support the safety profile of the influenza A(H1N1) vaccine used in pregnancy. However, there is a dearth of studies looking at adverse effects in the offspring of A(H1N1)-vaccinated mothers beyond the perinatal period and into early childhood. To provide further insights into potential adverse effects manifesting outside of the perinatal period, we conducted a study of long-term adverse events following pandemic influenza A(H1N1) vaccination in pregnancy in the general Danish population including 6308 vaccinated pregnant women. This study was approved by the Danish Data Protection Agency; informed consent is not required for register-based research in Denmark. We restricted the cohort to include singleton children born to women who were 18 to 44 years of age at pregnancy onset. Among mothers who had more than 1 pregnancy overlapping the study period, only the first was included. We also excluded births with a gestational age of less than 32 weeks (because preterm birth shortens the period of vaccination during pregnancy); births among women who had lived less than 5 years in Denmark (to ensure adequate capture of covariate information for the mothers); births among women who had been vaccinated before pregnancy onset; and children with diagnoses of chromosomal aberrations, genetic disorders, birth defect syndromes with known causes, and congenital viral infections possibly associated with birth defects (rubella, cytomegalovirus, herpes simplex, hepatitis, other viral infections including varicella, and unspecified congenital viral disease). Information on vaccination status and date of vaccination for the mothers was obtained from the national A(H1N1) vaccination database, established at Statens Serum Institute.21 In Denmark, the only vaccine used was the monovalent inactivated AS03-adjuvanted split virion influenza A(H1N1)pdm09 vaccine (Pandemrix; GlaxoSmithKline Biologicals). During the campaign, clinics administering the A(H1N1) vaccine were mandated by law to report all vaccinations to the Danish Board of Health. Furthermore, reimbursement from the Danish Health Insurance was made only after information on dates and details had been reported. Information on vaccinations may therefore be considered close to complete. The A(H1N1) vaccination campaign in Denmark targeted individuals with chronic diseases, key government officials, public-safety workers, and pregnant women.22 Pregnant women with chronic disease were recommended to get vaccinated during their first trimester. Pregnant women without chronic disease could get vaccinated after individual assessment by a physician. We estimated 2 separate propensity score models23 for maternal A(H1N1) vaccination in the first and second to third trimester. The first model included children whose mothers were vaccinated in the first trimester and children whose mothers were not vaccinated during pregnancy. Correspondingly, the second model included children whose mothers were vaccinated in the second or third trimester and children whose mothers were not vaccinated. Both models included the same predictors. All variables included in the propensity score models are listed in Table 1. After propensity score estimation, we created 2 distinct propensity score–matched cohorts for maternal vaccination in the first and second to third trimester. The propensity score matching was conducted using the nearest neighbor–matching algorithm (caliper width of 0.05 of the SD of the logit score) on a ratio of 1:4. Standardized mean differences were calculated to assess balance. Covariates with differences less than 10% were considered well balanced. All outcomes were based on information from the Danish National Patient Register.24 This nationwide register holds information on all hospital contacts in Denmark, including date of admission and discharge, setting of care (in terms of outpatient, inpatient, and emergency department services), and diagnoses (classified according to International Statistical Classification of Diseases and Related Health Problems, Tenth Revision codes). For the analyses of first hospitalization and all hospitalizations (the primary study outcomes), the outcomes were based on any inpatient hospital admission after start of follow-up. In the analysis of all hospitalizations, the number of hospitalizations was based on a definition in which a new admission was required to be preceded by at least 1 day outside hospital since the date of previous hospital discharge. For the analyses of individual infectious diseases and individual neurologic, autoimmune, and behavioral conditions, the outcomes were based on primary and secondary diagnoses codes identified from inpatient and outpatient hospital contacts. Specific International Statistical Classification of Diseases and Related Health Problems, Tenth Revision codes for the included individual conditions are presented in the eTable 1 in the Supplement. The children in the cohort were followed up from the date of hospital discharge after birth. For the analyses of first hospitalization, follow-up was censored at the date of the first hospital admission. For the analyses of individual conditions, follow-up was censored at the date of an event of the individual outcome under study. Other censoring criteria for all analyses were death, emigration, or disappearance; becoming 5 years of age; and end of follow-up (December 31, 2014). The analysis of first hospitalization was conducted using proportional hazards regression yielding hazard ratios (HRs). The analyses of individual conditions and all hospitalizations were conducted using Poisson regression yielding rate ratios (RRs).25 For the latter analysis, generalized estimating equations26 were used to take into account the possibility of nonindependence between consecutive hospital admissions in the same child. For covariates with missing values, we treated missing values as a separate category except for variables with very few missing values (<1.0%) where we used mode imputation. The proportion of missing was less than 5% for all 5 covariates that had missing values (Table 1). We considered effect estimates to be statistically significant if the 95% CI did not overlap 1. Analyses were performed with SAS software version 9.4 (SAS Institute). We identified a total of 69 598 children from pregnancies that overlapped the A(H1N1) vaccination period; 61 359 children were available for study inclusion: 55 048 with unvaccinated mothers, 349 with mothers who were vaccinated in the first trimester, and 5962 with mothers who were vaccinated in the second or third trimester (Figure 1). The baseline characteristics of mothers vaccinated in the first trimester before propensity score matching are shown in Table 1. Compared with mothers who were unvaccinated, mothers vaccinated in the first trimester were more likely to be in the age group of 35 to 44 years of age; were more likely to be overweight or obese and less likely to be of normal weight; were more likely to have had a diagnosis of cardiovascular, neurological, and rheumatic disease, as well as inflammatory bowel disease and disorders of the genital tract; were more likely to have been hospitalized for more than 5 days in the year prior to pregnancy; had more outpatient hospital contacts; and had more prescription drug use, both in terms of treatments for specific conditions and the number of different drugs used. The matched cohort included 347 children to vaccinated mothers and 1383 children to unvaccinated mothers. After propensity score matching, unvaccinated and vaccinated mothers were similar on all measured characteristics; the baseline characteristics of the matched cohort are shown in Table 1. Standardized mean differences are shown in eTable 2 in the Supplement; all covariates were well balanced. The results from the analyses of first hospitalization are shown in Figure 2A. A total of 858 children were hospitalized during follow-up: 675 children to unvaccinated mothers (rate of hospitalization per 1000 person-years, 171.6) and 183 children to mothers vaccinated in the first trimester (rate of hospitalization, 199.3). The risk for first hospitalization was not significantly higher among children to mothers vaccinated in the first trimester compared with children of unvaccinated mothers at 5 years’ follow-up (HR, 1.13; 95% CI, 0.96-1.32). The estimates were similar at 1 and 3 years’ follow-up. Table 2 shows the results from the analysis of all hospitalizations. Maternal first trimester vaccination was not associated with an increased number of hospitalizations at 5 years’ follow-up (RR, 1.17; 95% CI, 0.94-1.45). Similarly, the number of hospitalizations was not significantly higher at 1 or 3 years’ follow-up. The analyses of individual infectious diseases and neurological and behavioral conditions are presented in Figure 3. First trimester maternal vaccination was not associated with a significantly increased risk for 22 of the 23 individual outcomes; the risk for other infections was increased (RR, 1.71; 95% CI, 1.08-2.73). Taking multiple comparisons into account using Bonferroni-corrected confidence intervals, there was no significantly increased risk (RR, 1.71; 95% CI, 0.83-3.56). Characteristics of mothers vaccinated in the second or third trimester before matching are shown in Table 1. Vaccinated mothers were less likely to be 18 to 24 years of age; more likely to be married; more likely to have a medium or long tertiary education; more likely to have an income in the top distribution tertile; less likely to be nulliparous; and more likely to have 1 to 2 children. After matching, the cohort for the analyses of second or third trimester vaccination included 5961 children to vaccinated mothers and 23 603 children to unvaccinated mothers; the 2 groups were well balanced on all measured prepregnancy maternal characteristics (Table 1 and eTable 2 in the Supplement). Figure 2B shows the risk for first hospitalization in the matched cohort. During follow-up, 13 260 children were hospitalized: 10 633 children to unvaccinated (rate of hospitalization, 151.6) and 2627 children to vaccinated mothers (rate of hospitalization, 137.5). Vaccination in the second or third trimester was not associated with an increased risk for first hospitalization at 5 years’ follow-up (HR, 0.95; 95% CI, 0.91-0.99); risks were similar for second trimester vaccination (HR, 0.93; 95% CI, 0.87-0.99) and third trimester vaccination (HR, 0.98; 95% CI, 0.92-1.04). Truncating follow-up at 1 year (HR, 0.94; 95% CI, 0.89-0.99) and 3 years (HR, 0.95; 95% CI, 0.90-0.99) yielded similar results: no significantly increased risks. Results from the analyses of all hospitalizations are shown in Table 2. Vaccination in the second or third trimester was not associated with an increased number of hospitalizations at 5 years’ follow-up (RR, 0.93; 95% CI, 0.87-0.99); risks were similar for second trimester vaccination (RR, 0.92; 95% CI, 0.85-0.99) and third trimester vaccination (RR, 0.94; 95% CI, 0.85-1.03). Truncating follow-up at 1 year (RR, 0.93; 95% CI, 0.87-0.99) and 3 years (RR, 0.96; 95% CI, 0.90-1.01) yielded similar results: no significantly increased risks. Figure 3 shows the results from the analyses of individual conditions. Vaccination in the second or third trimester was associated with a significantly increased risk for sepsis (RR, 1.96; 95% CI, 1.26-3.05) and Sjögren syndrome (RR, 1.59; 95% CI, 1.04-2.44). This was offset by significantly decreased risks for upper respiratory infections (RR, 0.92; 95% CI, 0.85-0.99) and gastrointestinal infections (RR, 0.84; 95% CI, 0.74-0.94). Taking multiple comparisons into account using Bonferroni-corrected confidence intervals, there was no significantly increased risk for sepsis (RR, 1.96; 95% CI, 0.98-3.91) and Sjögren syndrome (RR, 1.59; 95% CI, 0.82-3.11) or reduced risk for upper respiratory infections (RR, 0.92; 95% CI, 0.81-1.03) and gastrointestinal infections (RR, 0.84; 95% CI, 0.70-1.00). In this comprehensive cohort study of Danish children born to A(H1N1)-vaccinated mothers, we found no support for an increased risk for early childhood morbidity following A(H1N1) vaccination exposure. Children exposed in the first trimester were more likely to be hospitalized but not statistically significantly so. However, we recognize that first trimester vaccination was rare in our cohort and that lack of statistical power cannot be discounted as an explanation for this null finding. Residual confounding is also a possible explanation for the small increase in risk we observed. Although we used propensity score matching with a wide range of baseline maternal characteristics, it is possible that confounding by indication is still present. Children exposed in the second or third trimester were not at an increased risk for hospitalization. These analyses were well powered statistically and we can exclude even small excess risks with a high degree of certainty. Instead, we observed statistically significant reductions in hospitalization risks of 7% for all hospitalizations until 5 years of age and 5% for the first hospitalization until 5 years of age. In the analyses of specific diseases in childhood, we observed significantly increased risks for other infections, sepsis, and Sjögren syndrome. We have no obvious explanation for these effects. The risks for sepsis and other infections are unlikely to reflect increased susceptibility to infections in general or bacterial infections in particular because we saw no increased risk for meningitis and significantly reduced risks for upper respiratory infections and gastrointestinal infections. However, multiple testing cannot be discounted as an explanation; we analyzed 2 exposure windows and 23 outcomes. Indeed, taking multiple comparisons into account using the Bonferroni correction, no significantly increased risks for other infections, sepsis, and Sjögren syndrome were observed. Given that infectious diseases comprise most hospitalizations in early childhood, this group of outcomes is responsible for the reduced risks observed in all hospitalization outcomes. 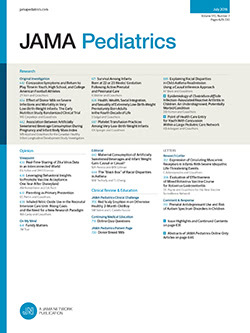 Although a reduced risk for both laboratory-confirmed influenza and influenzalike illness have been observed among infants of vaccinated mothers,27 this effect is attributable to maternally transferred antibodies and is restricted to early infancy in contrast to the effects observed in our study, which persisted throughout early childhood and comprised infectious diseases other than influenzalike illness. Further studies looking at individual infectious diseases in greater detail would be necessary to confirm and elucidate the reduced risks observed in our cohort. To our knowledge, few studies have been published on possible adverse effects extending into early childhood after A(H1N1) vaccination exposure during fetal life. Ludvigsson and colleagues28 conducted a Swedish cohort study of maternal A(H1N1) vaccination and offspring mortality. No increased risk of stillbirth, early neonatal death (days 0-6 after birth), or early childhood death (7 days-4.6 years) was observed. Van der Maas and colleagues29 conducted a cross-sectional linkage study in the Netherlands with extensive questionnaire data on adverse pregnancy outcomes, growth and development of the offspring, and general practitioner contacts for infectious diseases during the first year of life. All outcomes evaluated, including infection-related contact rates, were similar in A(H1N1)-vaccinated and -unvaccinated pregnancies. The main strength of our study was its comprehensive design with register linkage of individual-level data. Information on A(H1N1) vaccination and study outcomes was obtained through an independent nationwide database, with mandatory reporting improving the accuracy of information and reducing bias. We used a propensity score–matched design incorporating a large number of maternal characteristics to control for potential confounding. Our study also had a number of limitations. Vaccination was rare in the first trimester in our cohort, limiting the conclusions that can be drawn from our results. Although, we did include a wide range of maternal characteristics, we cannot exclude residual confounding, especially in the first trimester cohort, where vaccination was offered to mothers with chronic diseases and high-risk pregnancies. Our study attempted to describe early childhood morbidity in vaccinated and unvaccinated pregnancies. Our results are primarily applicable in the context of hospitalizations in general and the specific diseases we chose to include and to the monovalent inactivated AS03-adjuvanted split virion influenza A(H1N1)pdm09 vaccine used in Denmark. Given the continually changing composition of seasonal influenza vaccines, it will always be difficult to provide comprehensive postlicensure safety studies in a timely manner. However, with respect to current and future seasonal influenza vaccines, we believe it is reasonable to assume that our results contribute to the safety profiles of both AS03-adjuvanted and influenza A(H1N1)-containing vaccines used during pregnancy. To our knowledge, this is the most comprehensive study to date of potential adverse effects manifesting after the perinatal period. We hope that other researchers can use the study as a template to explore early childhood effects of vaccination in pregnancy, an area of vaccine safety research that is almost completely unexplored. In conclusion, our results support the overall safety profile of the influenza A(H1N1)pdm09 vaccine for use during pregnancy and support World Health Organization recommendations that pregnant women should be vaccinated with influenza vaccine. Accepted for Publication: October 18, 2016. Corresponding Author: Anders Hviid, DrMedSci, Department of Epidemiology Research, Statens Serum Institut, Artillerivej 5, 2300 Copenhagen S, Denmark (aii@ssi.dk). Author Contributions: Dr Hviid had full access to all of the data in the study and takes full responsibility for the integrity of the data and the accuracy of the data analysis. Drafting of the manuscript: Hviid, Lambach. Critical revision of the manuscript for important intellectual content: Svanstrom, Mølgaard-Nielsen, Lambach. Administrative, technical, or material support: Lambach. Conflict of Interest Disclosures: Dr Lambach works for the World Health Organization. Dr Hviid is supported by a Hallas-Møller stipend from the Novo Nordisk Foundation. No other disclosures were reported. Funding/Support: This study was supported by the World Health Organization and the Novo Nordisk Foundation. Disclaimer: The authors are responsible for the views expressed in this publication and they do not necessarily represent the decisions, policy, or views of the World Health Organization.